Do you ever ask yourself can you make mashed potatoes without peeling the potatoes? 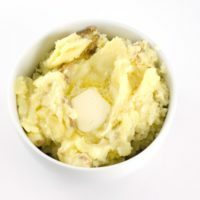 The answer is yes with this skin-on mashed potatoes recipe! If someone did a poll asking both kids and adults what their favorite side dish to go with dinner was, I’d be willing to bet that mashed potatoes would be near, if not the very, top answer. I love mashed potatoes myself. They’re warm and comforting and taste great whether you make them simple or add several other ingredients. Mashed potatoes are fairly easy to make, too. Well, except for one of the kitchen chores I hate most: peeling potatoes. It’s not that peeling potatoes is hard, I just hate doing it. Mr. Savvy does most of the grocery shopping and it seems to never fail that he always gets the smallest potatoes, which I think are harder and more time consuming to peel. And yes, I have even cut myself with a vegetable peeler before. No, I don’t understand how either. Can You Make Mashed Potatoes With Skin? Yes! You can make mashed potatoes without having to peel them with this skin-on mashed potatoes recipe. You’ll want to make sure to use fresh potatoes when making homemade mashed potatoes with skin. You don’t want to use potatoes on their way out or thick-skinned potatoes. What Potatoes Are Best To Use For Skin-On Mashed Potatoes? I also like to leave the potato skins on in my mashed potatoes because there are added health benefits like additional fiber and more nutrients. I like using Yukon Gold or Red Potatoes. I find that Yukon Golds are good if you want smooth mashed potatoes while red potatoes are good for chunkier mashed potatoes as they are easier to over mix into a glue-like consistency in my experience. Otherwise, skin-on mashed potatoes come together just like regular mashed potatoes in their creamy, buttery goodness. 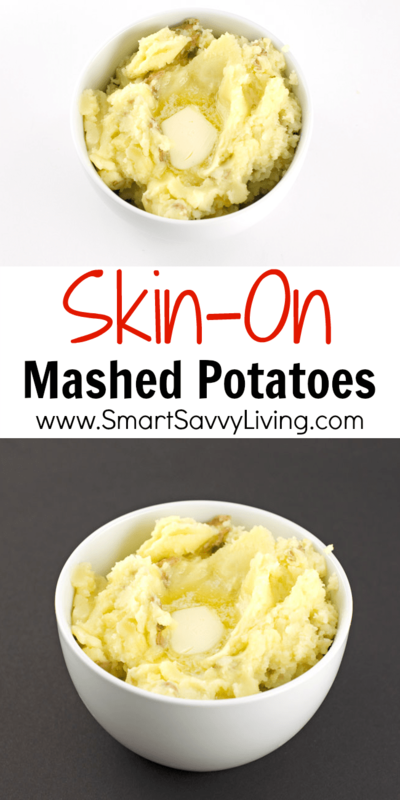 Here are some of my favorite products to use when making skin-on mashed potatoes. A vegetable scrub brush – I don’t really like the idea of using a brush I scrub dishes with. A good knife for chopping the potatoes – I love this brand of knives because they are affordable, but they also hold up well and are easy to clean. A large pot for boiling the potatoes – This is one of my go-to pots for almost everything, even boiling. I like heavy pots like this because they heat pretty evenly and so potatoes on the bottom don’t get burned. 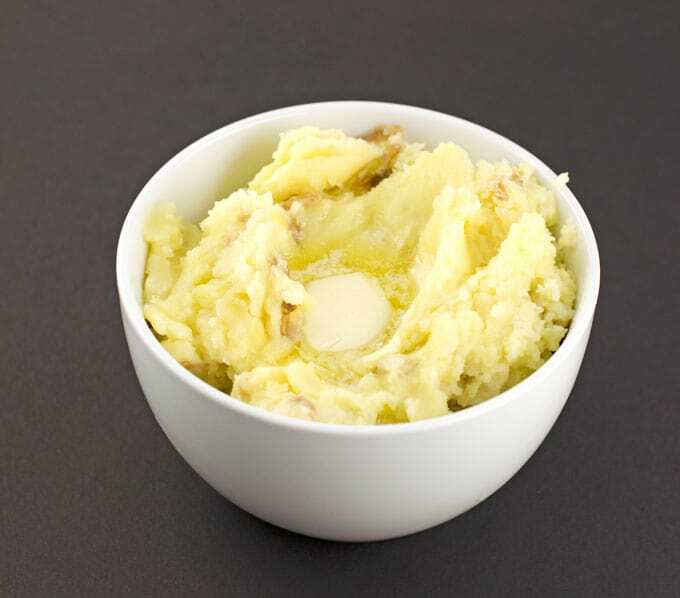 A large strainer – With or without the skin, the best mashed potatoes are made with well-drained potatoes. A potato masher or my usual preference, a hand mixer – I prefer using a hand mixer because you can still get super smooth and creamy mashed potatoes with the skin still on.Some of the skin will get wrapped around the beaters, but that’s okay. Just be careful to not over mix. If you like chunkier mashed potatoes, use a potato masher. Set out butter to soften if it isn't already. Thoroughly wash and scrub potatoes until they are very clean. Cut out any bad spots or eyes. Cut unpeeled potatoes into large chunks that are as even in size as possible. Place potato chunks into a pot of cold, salted water, cover, and bring to a boil. Boil the potatoes until they're tender, about 20 minutes. Thoroughly drain potatoes in a strainer and place back in the warm pot over low heat. One key to great mashed potatoes is getting rid of any water before mashing. 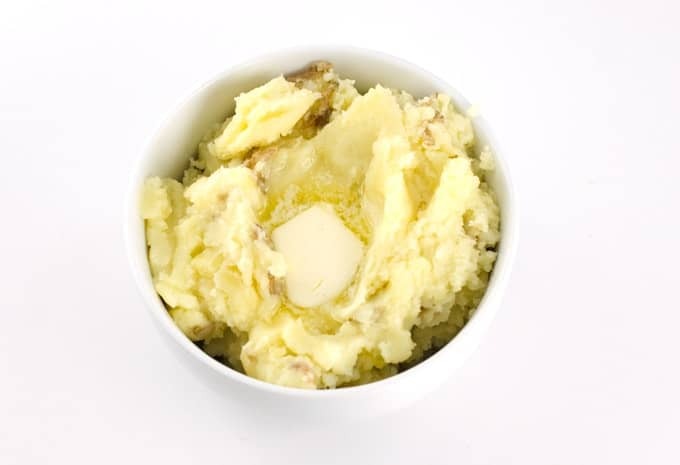 Add butter and start mashing potatoes with hand mixer or potato masher. Add sour cream and/or cream. If using cream, I recommend slowly streaming it in because I never use the exact same amount each time due to the slight weight difference in the amount of potatoes used. Top with extra butter, if desired. Serve immediately. Leftovers can be stored covered in the refrigerator for up to 3 days. To make extra special with a punch of flavor consider adding in shredded cheese, chopped green onion or chives, etc.